Prickly ash is a native North American shrub or tree, growing from 10-25 feet high; as the name indicates, the branchlets bear prickles up to 1/2 inch long. The leaves are alternate and odd-pinnate, with 5-11 ovate or elliptic leaflets that are softly hairy beneath. Small, yellowish-green flowers grow in axillary clusters during April and May, before the leaves appear. The fruit is a small, berry-like capsule containing one or more black seeds. The oval capsule varies from green to red and blue-black in color, and grows in clusters on the top of the branches. The taste is pungent, causing salivation, and there is little odor when the tree is cut. Found in damp soils, rocky woods, on river banks from Canada to Virginia and Nebraska. Much less common in the south. Gerard and Pliny believed that snakes had such an antipathy for the ash tree, that if a snake was encompassed with ash tree leaves, the snake would sooner run through fire than through the leaves. According to Culpeper he personally observed this to not be the truth. 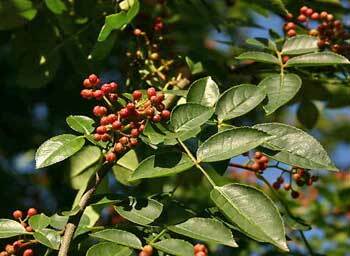 Prickly ash bark was a toothache remedy for Native Americans and Europeans in earlier times. It is not clear whether relief was due to an actual effect on the pain or to the distraction of attention caused by irritation produced by the bark. Some Native Americans boiled the inner bark to make a wash for itching skin. Both the bark and the fruit have been used to treat rheumatism and chronic arthritis. Said to be good for stomach problems, such as flatulence and poor digestion. A wash of the infusion of powdered bark may be used to cleanse old wounds, sores, and ulcers. Was used for many skin conditions, psoriasis, worms, yeast infections, syphilis, colic, liver problems, scrofula, and chronic female troubles, asthma, colds, flu, cholera, blood purifier, lumbago, dysentery, diarrhea, sore throats, tonsillitis, coughs, snakebites. Infusion or decoction: use 1 tsp. dried bark or berries with 1 cup boiling water. Take 1 cup a day, cold, one swallow at a time. Tincture: a dose is 5-20 drops.